The scene action occurs inside the camera frame, so it is really important to set it up correctly. By default, Toon Boom Studio automatically adds a camera to every new project you create, but you can also add your own camera layer if needed. The default Camera layer cannot be deleted. 1. In the Timeline view, click the Add Element button. ‣ In the Type drop-down menu, select Camera. ‣ In the Name field, type in a name for your Camera layer. By default, the name of your Toon Boom Studio project appears in this field. ‣ In the Number field, type in the number of Camera layers you want to add. You can also use the up and down arrow buttons to change the numbers. The new Camera layer appears in the Timeline view. You can also use the Scene View toolbar (Top toolbar on Mac OS X) to add a new Camera layer to your scene. 1. In the Scene View toolbar (Top toolbar on Mac OS X), click the Camera drop-down menu button. 2. Select Add Camera from the drop-down menu. A new Camera layer appears in the Timeline view. Refer to Discovering the Interface to learn how to customize your workspace and display the different toolbars. The Camera layer provided in your scene is the active camera by default. If you add several cameras to your scene and want to have different settings on each, you can use the Scene View toolbar (Top toolbar on Mac OS X) camera list to switch from one camera to another. You can use this feature if you are still working on your scene composition and you have different camera setups to choose from. Remember that a peg is automatically attached to the camera. 2. Select a camera from the menu. In the Timeline view, the active Camera layer is displayed in italics. You can set the Camera Frame position by using the Animation Select tool or the Properties view. First, you can set the position of the camera frame. 1. 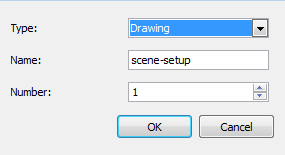 In the Animation Tools toolbar, click the Select tool or select Tools > Animation Tools > Select or press . 2. In the Camera or Timeline view, select the camera. The frame turns red in the Camera view. 3. In the Camera view, grab the camera frame and drag it to the desired position. As you position your camera, notice that the camera frame is moving slightly slower than your cursor. This is due to the perspective effect because the Camera is not situated at the same depth level as the elements. You can set your Active Camera to the Default Camera using the Scene View toolbar (Top toolbar on Mac OS X). This will enable a default camera frame in which you can position your Camera frame without experiencing the perspective illusion. Note that you cannot move the default camera; it is only an indication of the default camera space. 1. In the Scene View toolbar (Top toolbar on Mac OS X), click the Camera menu button and select Default. A checkmark identifies the currently active camera in the list. You can also set the Field of View, which is also called the Zoom level of the camera frame. 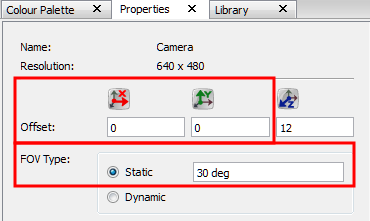 If the default camera is enabled, you can not set the Field of View angle with the Select tool. 1. In the Camera or Timeline view, select the camera. Once it is selected, the frame will become red in the Camera view. 2. In the Camera view, grab the FOV square at the bottom of the frame and drag it to change the zoom level. You can also set the camera position and field of view with exact values using the Properties view. 1. In the Camera or Timeline view, select your camera. The Camera information is displayed in the Properties view. ‣ Offset: Type in the X and Y position values. Static: By default the Static Field of View type is enabled, this means that the zoom value will not be animated, it will stay the same throughout the scene. Type in the desired Field of View angle value. Dynamic: Enable this option to animate the zooming value over time—see Animating the Camera to learn more about animating the Field of View. You can change the type of unit to be displayed and used in the Properties view to inches or centimetres instead of the default Field values—see Preferences.